Earlier today, the California legislature voted to approve AB 376, the excitingly titled “act to add section 2021 to the Fish and Game Code, relating to sharks”. The ocean conservation community is happy, and we should be. The bill and its backing from Hollywood stars have generated substantial media coverage of the plight of sharks, and, if signed into law by the Governor and properly enforced, it could well save a lot of sharks. However, fin bans aren’t the perfect solution to the shark conservation crisis, and we still have a lot of work to do to protect sharks and closely related species around the world. Based on similar laws passed in Hawaii and Washington, AB 376 will make it illegal “for any person to possess, sell, offer for sale, trade, or distribute a shark fin” in the state of California. In other words, it aims to reduce the demand for shark fin soup by making it illegal to have fins. AB 376 is not a ban on “finning” (defined as cutting off a shark’s fins and dumping the rest of the animal overboard- if the shark is still alive at this point it will bleed to death or drown). Although a few exceptions in regulations exist and there may be more associated with this law (stay tuned, I will look into the exceptions to AB 376 and write a follow-up post), shark finning at sea has been illegal in U.S. Atlantic waters since 1993 and nationally since 2002. Laws like AB 376 make it illegal for people to possess the shark fins themselves, not for fishermen elsewhere to acquire them in the first place. It is hoped that reduced demand will result in a reduction in supply. 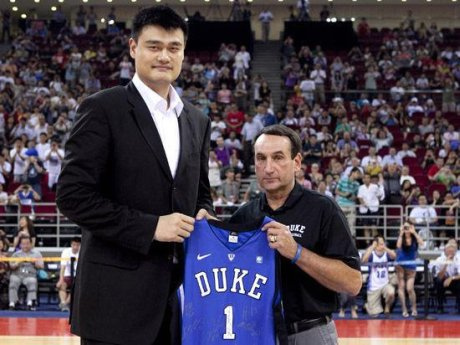 While it’s true that California has one of the largest markets for shark fins outside of Asia, that’s a little bit like saying that Mike “Coach K” Krzyzkewski is the tallest person in this photograph other than shark conservation advocate Yao Ming. 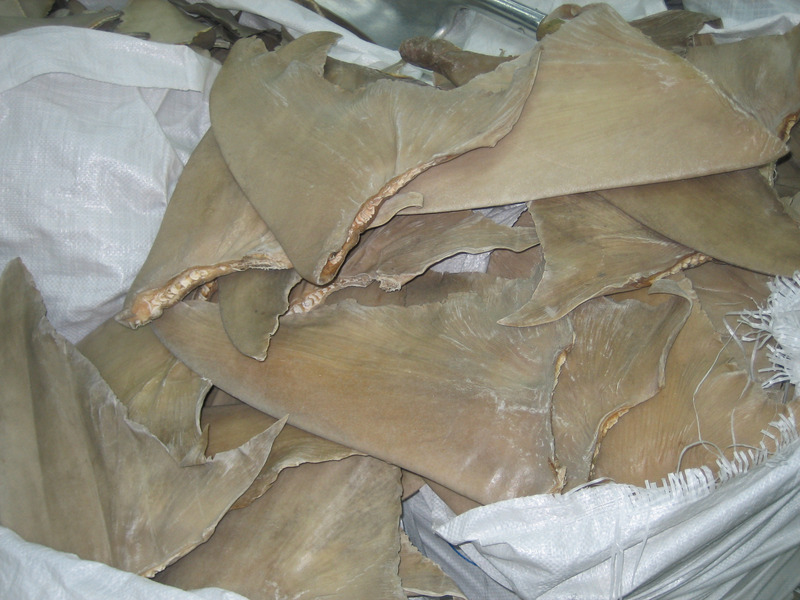 Additionally, while some of the fins that AB 376 bans entered the market through finning at sea in other countries, others entered the market after U.S. fishermen landed the sharks with fins naturally attached (possibly as part of a quota), which is completely legal in the U.S. and much better from a management perspective. * Blanket bans on possessing all fins such as AB 376 do not distinguish between fins that entered the market through morally-objectionable and unsustainable finning at sea and fins that entered the market through the better practice of fully utilizing the shark under science-based quotas. Instead of encouraging best practices, fin bans may, in some cases, hinder legal and sustainable business by well regulated fishermen. While some conservationists and animal welfare advocates believe that consuming shark fin soup is morally wrong regardless of where the fins came from, many mainstream environmental groups have been advocating for sustainable fishing practices. For many species of sharks, the market for fins is a major driver of population declines, and reducing demand for fins will undeniably help these animals. For many other species of sharks, as well as equally threatened skates and rays, the major threats are lack of science-based quotas despite high demand for meat or oil, and bycatch. Fin bans do nothing to stop these problems. Still others need their critical habitats protected from coastal development and research into their life history. Marine protected areas or bans on fishing during breeding aggregations are critical for the recovery of other species. In short, even if the market for shark fin soup disappeared overnight worldwide (which laws like AB 376 would not accomplish), sharks would still need a lot of help. I believe that (within reason), anything that reduces the number of sharks killed unsustainably and wastefully is a good thing, and we should celebrate the vote on AB 376. However, we should also endeavor to encourage more sustainable fishing practices such as landing sharks with their fins naturally attached, and we should greatly expand the focus of the conservation movement to include the many other threats facing sharks. Congratulations to everyone who helped get this important piece of legislation passed. Now let’s get back to work! * While landing sharks with fins naturally attached still results in a dead shark, it is much easier for inspectors to ensure that finning did not take place and to determine how many sharks of each species have been landed when they can examine a carcass with the fins attached instead of a pile of fins. David, I was at the Taj Mahal in Atlantic City, NJ this weekend and saw that one of the restaurants there, Dynasty, had shark fin soup on their menu. Really upset by that! Hopefully NJ will follow in California’s footsteps and ban fins here as well! The sustainability argument is a Catch 22 for shark fishermen. The law could be written to allow the sustainable fishing of sharks, but as of now, there are no sustainable shark fisheries. Very true, Angelo. Regardless, I think we should support best practices whenever possible. and 51747.1 to, the Education Code, relating to schools. software necessary for the pupil to participate in the course. making satisfactory educational progress, as defined. exceptions are deemed to be minor and inadvertent. I’m really happy about this, I want the same things to happen in Britain!